PANAMA CITY (CNS) -- One thing is clear about World Youth Day 2019: This one is not focused on convening great masses of people, or the most influential or the loudest. Instead of highlighting the problems faced by youth in the world's richest or most populous countries, one of its first events focused on the plight of populations most of the world rarely sees or comes across: the indigenous. Edigibali Lopez, 24, and Enith Sanchez, 23, members of two different indigenous communities in Panama, spoke from experience about the loss of ancestral lands, the negative impact of climate change on their communities and the discrimination indigenous people face, including at the hands of those who share the same Catholic faith. The women shared the stage at the Atlapa Convention Center Jan. 22 to talk about indigenous youth just before the official start of World Youth Day, taking place Jan. 22-27 in Panama City. "One of the important aspects of being at World Youth Day is to get others to acknowledge our reality, to learn about our culture and to not listen to the prejudices they have of us as indigenous people, this idea that we don't worship the same God," Sanchez, a member of the Ngabe community native to western Panama, told Catholic News Service. That was one of the topics young indigenous people spoke about prior to the official start of World Youth Day in an event tailored for populations like theirs, the World Indigenous Youth Gathering, which took place Jan. 17 to 21 in Soloy, Panama in Sanchez' indigenous Ngabe-Bugle community. 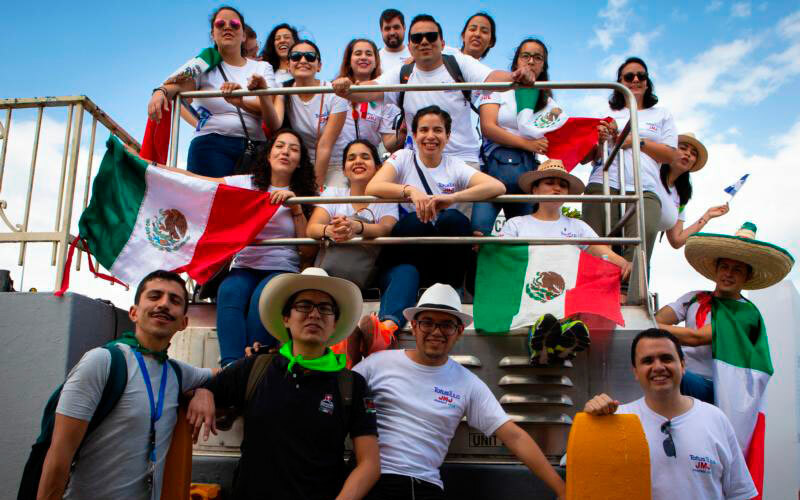 Organizers said more than 400 indigenous youth from Panama, Guatemala, Brazil, Mexico, Peru, Bolivia and Honduras attended, making it the first time such an event has taken place at World Youth Day. At the meeting, those like Lopez shared how climate change has altered the faith and communal living of their people. With climate change, the islands of the Guna Yala region in northeast Panama, where her community lives, disappear as rising tides result in loss of the ancestral lands of the Guna people, she said. "Each time the tide rises, and each time it rains, we experience flooding of the island, and we have to (physically) move to other territories," Lopez said. "We suffer because this is our land, the land of our ancestors." Each move brings loss of habitat and natural resources that the Guna use in their lives of faith, in blessings, in daily and weekly worship, and community rituals, she said. But it's not just a physical problem for their communities. "As indigenous people, we are focused on the care of our planet, our common home," Lopez said. "Because it affects all people, not just the indigenous, but it affects the entire world." Communities such as the Guna and the Ngabe may be the ones feeling it first, but ultimately climate change and its negative impact will reach others, and that's a concern for them, too, the women said. "We're focused on the care of all these resources that surround us to conserve (not just resources) but our people," Lopez said. As indigenous communities are forced to migrate from their native lands, some end up in cities or towns, where the way they dress, or speak, or practice their faith is not welcome, Lopez said. "Our hands are tied, and we have to start living in a different way," and that affects the young indigenous people who no longer live listening to their native language or learning about their culture from elders, who normally surround them in a traditional community setting, she said. "The children migrate to the city, the capital, and those cultural teachings from our ancestors are lost." In non-indigenous communities, the indigenous are looked down on because of the different languages they speak, the different way they dress, Sanchez said, so some of the youth begin changing who they are -- physically and otherwise. The dispersion of their community due to climate change affects the practices that make them unique. When one person lives in one town and the other in a city or another place, the sense of community vital to keeping customs and practices alive is lost, Sanchez said. "There is no way to come together as a people," she said. And that affects their lives of faith. "We, as a people, we have our faith and our way of doing things and sharing, but when we move from one place to another that's far removed, we become disconnected," Lopez said. "We're not putting into practice what is ours. This is what happens when we totally become disconnected from our people, and we're forced to face the problem of how do we make our faith grow as indigenous people?" Lopez and Sanchez said they appreciate Pope Francis' focus on their populations, on the challenges they face and his encouragement of young indigenous men and women like themselves. The church, too, through priests such as U.S. Vincentian Father Joseph Fitzgerald, who helped organize the gathering for indigenous youth, provide spiritual support that keeps in mind the cultural realities and other conditions they face, they said. In a video message, Pope Francis sent the gathering Jan. 18, he told them to "take charge of your culture, take charge of your roots. But don't just leave it at that." Using those roots, he said, "grow and flower." Panamanian Archbishop Jose Ulloa Mendieta, in his homily at the opening Mass for World Youth Day, acknowledged the marginalization faced by the indigenous and other groups, including young people who come from African ancestry. "World Youth Day in this region would not be possible without making their situation visible because they represent a significant number of the population of these continents, these youth who live in situations of exclusion and discrimination, that can be found on the margins and in poverty," he said. The church's acknowledgment, support and accompaniment has been important in how she feels about her culture and her roots, Sanchez said. "I'm very proud of who I am," she said. "An indigenous woman."